Many thanks to all who came out to the event on Saturday -- Exhibitors, EV Owners, and Friends alike. 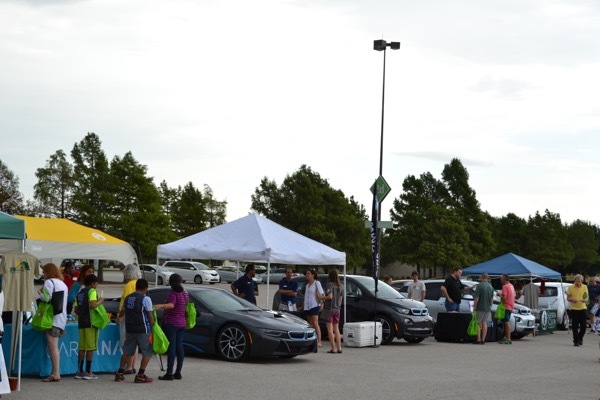 We had well over 100 EVS in attendance, which is certainly a Texas record! Photos and video from the event will be posted soon! The Dallas-Fort Worth (DFW) Clean Cities Coalition is excited to be planning the DFW event for National Drive Electric Week! This year’s DFW event will be held on Saturday, September 19, from 10:00am to 2:00pm in section 2C (between Neiman Marcus Last Call and Saks Off 5th) of the Grapevine Mills Mall parking lot. 10:00 am – Event Opening! Electric vehicle (EV) manufacturers, charging infrastructure retailers, EV fleet representatives, North Texas environmental and electric vehicle advocacy organizations, and even an electricity-powered bicycle company will be set up and ready to answer all of your questions! Additionally, start your day behind the wheel of an all-electric car! The Nissan Ride and Drive opportunity starts as soon as we do. Exhibitors and Ride and Drives will be available throughout the entire event. All North Texas electric and plug-in electric vehicle owners are called to join the largest gathering of EVs in North Central Texas! Check in to get your EV Owner badge and show off your ride. It won’t be an official record, but it will surely be one for the books! Let’s show everyone how DFW does EV! Tim Miller and crew, from DFW’s own The Car Guy Show will be on site to profile the event, talk to owners, and explore the world of EVs. All afternoon we'll be helping our Exhibitors raffle off awesome prizes and giveaways! You could win a Chevy Volt for a weekend -- just for showing up and chatting with Exhibitors and EV owners! Plus, all attendees who test drive a LEAF at the Nissan Ride and Drive opportunity will be entered into a drawing to win a LEAF sweatshirt, and iPad, or even a weekend with a Nissan Leaf. Stick around to see if you’re the lucky winner. The event wraps up and the packing up process begins. Thank you to everyone who attended and participated! Grapevine Mills has four level 2 (J1772) chargers and one CHAdeMO DC Fast-Charger. Charging stations are located in the same parking lot as the event. RSVP with the Register button above and to the Facebook event . Bring your friends! You can help us get the word out and let other North Texans experience the joys of Driving Electric. Share the Facebook event, and use the hashtags #texasEV, #NDEW2015, and #DFWCleanCities to let everyone know you’re attending! There are currently 466 attendees registered. Registered attendees report 2,312,577 electric miles driven.